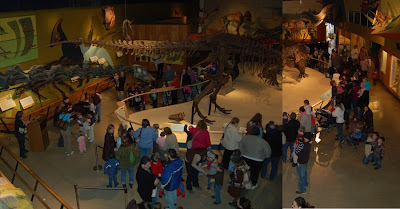 PALAEOBLOG: Dr. Scott + Kids = Dino Pandemonium! Dr. Scott + Kids = Dino Pandemonium! This is the scene right now in the Dino Hall of the CMNH. Kids and their parents are lined up out the door to meet Dr. Scott! That's Scott at the left signing autographs.